Press-moulded heavy slip glazed shallow bowl with flat handle moulded onto top of rim, angled downwards at end. Unglazed footring. West German studio pottery is extremely collectible with its distinctive patterns, textures and shapes. The range of colours, shapes, textures and sizes is mind-boggling. A number of factories produced these characteristic ceramics; Baykeramik, Carstens, Dumler & Breiden, Jopeko, Roth, Ruscha and Scheurich to name just a few. After a period of time being generally 'out of fashion' these amazing ceramics are being appreciated once more for their style and eccentricity. They are now regularly seen gracing the pages of design and interior magazines. This ramekin is indicative of the period from the 1950s to 1970s when innovation and production of these potteries was at its height. Garish coloring, bizarre patterning and contrasting forms: West German Studio Pottery is opinionated, you either love it or loathe it, which is surely better than mediocrity. From the 50s to the 80s, over 100 companies made art pottery in Germany. One of these was the company that made this ramekin. It was made with a variety of patterns and colours. It has been described as a “Bowl with a handle” by Dümler & Breiden. Brown, rough glaze underneath, inside and top of handle, 18 cm in diameter, measures about 6 cm tall. 0.430 kg. 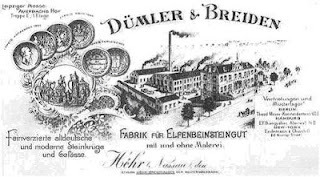 The company was founded in 1883 by Peter Dümler (b; 7 Nov 1869 d 19: Apr 1907) and his old school friend and later on, brother in law Albert Breiden (b: 12 June 1860 d: 27 May 1926) in western Germany not far from Koblenz. The pottery was located in the Westerwald town of Höhr, now known as Höhr-Grenzhausen. It is a town of a little under 10,000 people in the Westerwaldkreis in Rhineland Palatinate, Germany. It is still a center for ceramics and has a Ceramics College. It is known rather unkindly as Kannenbäckerstadt or Jug Baking Town. It also has the Westerwald Ceramics Museum. 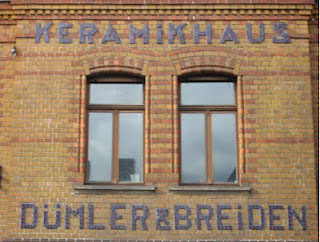 This factory was one of West Germany's leading ceramic companies during the 1950s and 60s. They produced a wide range of forms and glazes of good quality, using white clay with quirky styles and colours. Most notable was their “Fat Lava” design. Key Designers for D&B were Ernst Dümler, Paul Zimmerling, Rudlf Kügler and Rudolf Christmann. The company was successful, but lagged behind maket leaders such as Ruscha or Scheurich. Peter was the original designer, having been trained by both R. Hanke & S.P. Gerz. In turn Albert, trained by his uncle S.P.Gerz, ran the factory. Peter died in 1907 and Albert took over running the business, with the help of Bertha, Peter's widow. Peter's son, Paul stepped into his father's shoe's designing the Terra Sigillata range around this time, but his career was regrettably cut short, as he did not return from the First World War. 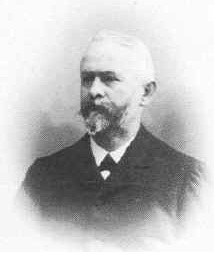 In 1918, a cousin, Ernst Dümler joined to take his place. Just before the war, in 1913, Albert had sold his share of the business. After the war, Albert managed the business of S.P. Gerz with the help of his sons, Adolf & Hermann. Albert died in May, 1926 at the age of 65 and Hermann continued the management of S.P.Gerz. Production finally ceased in 1995.